This Thai Grilled Salmon features a wonderful blend of the four big Thai tastes: spicy, salty, sweet and sour. Made with fresh herbs and spices, this salmon simply sings with flavor while never overwhelming the naturally delicious flavor of the fish. The marinade is a variation of traditional Thai magic paste - a special blend of fresh herbs and spices that will simply wow your taste buds. It works beautifully with salmon as well as other types of fish. If you enjoy true Thai flavors, give this dish a go! Place all marinade ingredients in a food processor or mini chopper. Process well to create a fragrant Thai spice paste (a pestle & mortar can also be used to make this paste). Rinse salmon pieces and pat dry. 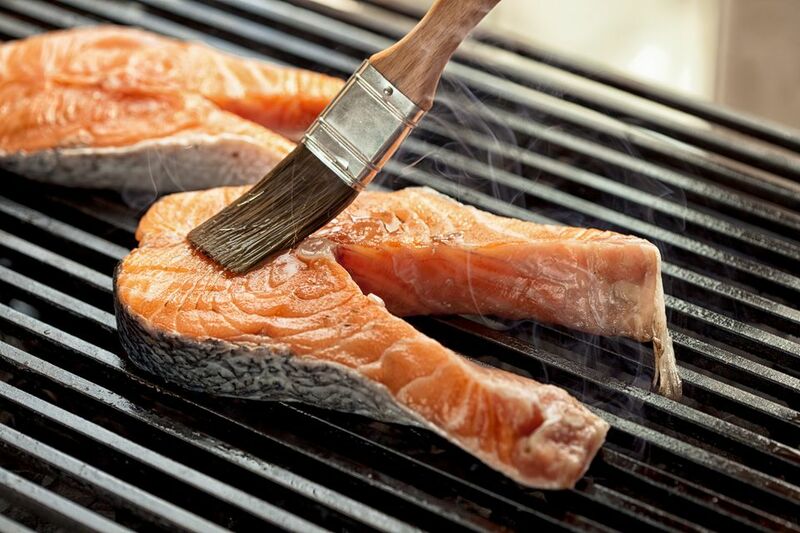 Place a bowl and slather the marinade/paste all over the fish, ensuring all surfaces are covered. Marinate 10 minutes or up to 24 hours. To make the side sauce, simply combine everything together in a cup, stirring well to dissolve the sugar. Then taste-test it, looking for a tangy flavor that is a balance between sweet, sour, spicy and salty. Add more lime juice if too salty or sweet for your taste. If too spicy, add more coconut milk. Set aside. Heat up your grill and brush with a little vegetable oil. Grill the salmon, allowing each piece to cook several minutes before disturbing/turning (this will prevent flesh from tearing). Baste the first time you turn it with some of the leftover marinade. Salmon is cooked when inner flesh is no longer translucent. Serve the salmon with rice or salad, plus the sauce on the side (note: this sauce is usually served at room temperature). An easy salad that goes beautifully with this dish is Easy Thai Cucumber Salad.